You don't get to decide which device people use to access your website. Mobile is the best thing that ever happened to your content. If you’re ready to roll up your sleeves and start planning your content strategy for mobile, a workshop will get you off to the right start. We offer half-day, full-day, and two-day hands-on workshops, as well as shorter presentations and talks. Need something more specific? We also offer custom training sessions of a week or more. Not sure what to do about getting your content on mobile? The best place to start is with the first step. With an audit of your existing content and CMS infrastructure, you’ll be able to plan and develop a business case. You’ll leave with a clear picture of where you want to be on mobile, and a roadmap for how to get there—baby steps and long term. Let’s do this thing. From developing a long-term vision and roadmap, all the way through information architecture, content development, and editorial process and workflow, you’ll get hands-on help every step of the way, from the person who wrote the book on how to do it. 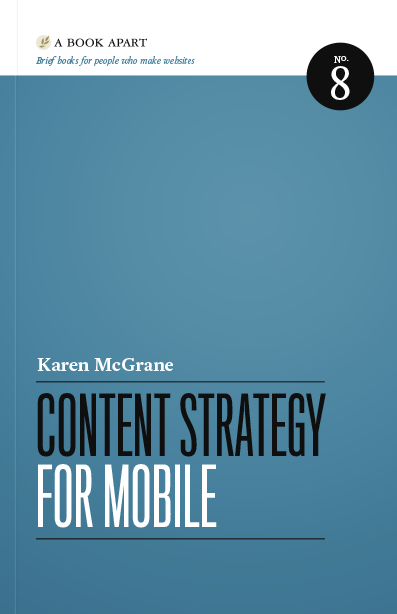 Read Content Strategy for Mobile by Karen McGrane.